I have the CAD files that I used in making the TR6 rear disc brake brackets. This jpeg attached is without information just to give you the idea of quality. These are free for the asking and an email account that can take some large files. These references, resources, the materials and products on this site are provided "as is" and without warranties of any kind, whether express or implied. 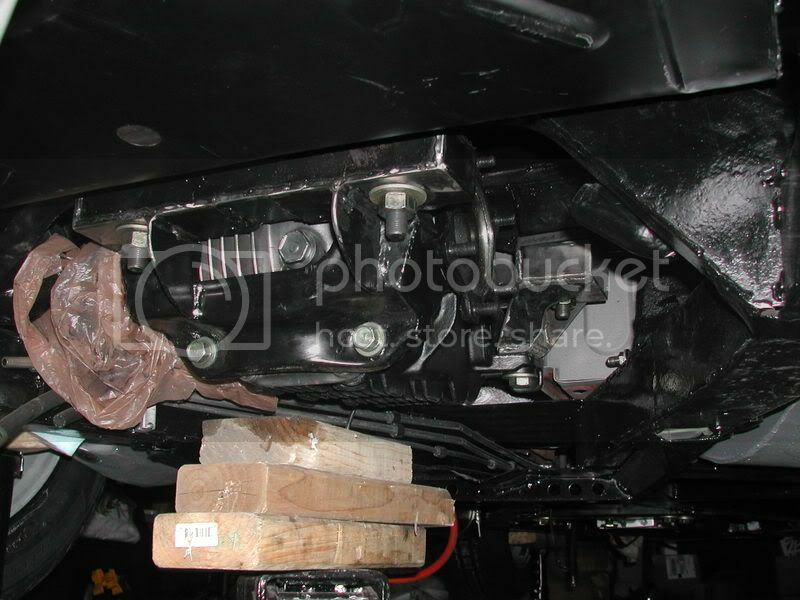 To the fullest extent permissible pursuant to applicable law, this automotive brake modification is undertaken at your own risk and disclaims all warranties, express or implied, including, but not limited to, implied warranties of merchantability and fitness for a particular purpose and non-infringement. The provider does not represent or warrant that the functions contained in these resources will be uninterrupted or error-free, that the defects will be corrected, or that this site or the server that makes the site available are free of viruses or other harmful components. The provider does not make any warrantees or representations regarding the use of the materials in this site in terms of their correctness, accuracy, adequacy, usefulness, timeliness, reliability or otherwise. By purchasing this custom rear brake conversion or undertaking your own modifications based on these materials as reference, the provider shall not be liable for any special or consequential damages that result from the use of, or the inability to use, the materials on this site or the performance of the products. Send them to my email or do I have them on the cd you sent? Thanks for the lead on the Supra. One reason for the brackets, as opposed to a full rear system swap, was to reduce the level of fabrication needed to make the conversion from drums. I agree that a complete system would be best. Most of those looking at this option will modify the frame to accept a Ford 9" and convert to rear disc brakes. 1) the TR6 frame does not lend it's self of a complete sub assembly, like the Supra, Jag, Ford Explorer, etc. 2) The Supra runs a 2 piece drive shaft and the flange attachment is not a U-Joint , but a flex plate. Not that this is bad but a drive shaft system would need to built or the flange plate on the differential would need to be fabricated to mate the TR6 drive shaft. 3) The front and rear mounts look like a mounting plate could be fabricated just like the Richard Good Parts kit for the Nissan differential kit , but the upper and lower control arms would need to be modified or replaced with a narrower stance to fit the TR6 width. Please share with the group more info on the Supra rear system as we are always looking for options on modification for our rides. 4) Price? Each region has different rate and resources, but in my region of the States the complete Supra rear system is rare and running about $1800, if they are found. $800-900 for just the differential. (USED, not rebuilt) I must keep in mind that IRS system are not cheap, but trying to keep to a budget does impact our directions. Any resources you can share? I'm posting this with his permission. A gent in Canada is getting ready to make a run of about ten sets! A fellow TR6 has requested he turn out a set of brackets. Francois has offered to make about 10 sets. Check out his TR6 mods. I love the shroud cover.......that's HOT! A Custom Auto Shop in Texas has made another run on the rear disc brake brackets. The picts also show Richard Goods CV Joints installed with the brackets and coil overs. Please contact them directly if you are interested. You're going to write an article about this whole set-up, aren't you? In some of the photos show a stock frame being used and other photos show a Ratco frame being used. The sway bar I believe is from Revington TR UK. Maybe between Don and I, we can write the article that should be done with this setup. I did take notes on how mine were done. I think Don should take all the credit for the article as for he drew up the cad files for the brake brackets. I'm getting a quote on 10 sets of these brackets to be made shortly (with Don's files). When I get the quote back I will post here in this section of the price. The price will be what I paid for them + shipping to .... Just helping out the Triumph owners. With regards to the Supra rear end. I am running one in my project along with custom CV axles. It is narrower than the TR pumpkin or Nissan, but it will require axles that are unequal in length. Also, my diff has a 4 bolt flange that bolts up to the drive shaft. It is out of a 91 Turbo supra LSD. The mounts were custom fabricated by me and not too difficult. I would have gone the Nissan route but I already had this differential sitting around. I know that Calvin and I can share a lot of lessons learned and by others that have taken on this type of modification. So Calvin, look for the first draft coming you way. Just what you need while your building your TR6-LT1, fixing up the Spit with your son, producing brake brackets, (see below comment) and keeping me out of trouble! Nice work on the differential swap! Looks robust! Please send us more pics and specs on the mounts and "How 2s" What did you design for the front mounts? I know that others are looking for replacement/ performance options! Plus our friend and fellow British/American motor-head is working on another production run of the TR6 Rear Disc Brake Brackets! Not for money, but for the SPORT! Not as a business, but as a help to others! (he already has a set on his TR6) The cost to CNC one set is too much for most people, but with quantity, the cost drops to with in reason. If you would like to motor down this modification road, please contact Calvin directly. Here is a shot of what got the thinking process going. I friend had a Nissan 240Z that he converted to rear disc with a kit. The swing arm desing is not that different. OK, different enough that it did not fit, but started the brain cells talking to each other. More to come from "CalvinDon Publications"
OK...The run of TR6 brake brackets has started. They should be done in a couple of weeks. I don't think the rules here let me post the price or sell something here in this section. E-mail if you have interest or PM me. My E-mail has been posted above. I have 10 sets being made at this time, and can do another run later if more people want them. Note* If you order Richard Good's CV axles and use these Brake Brackets, "TELL" Richard about the 1/2" brake bracket going between the trailing arm and the hub. He will compensate the difference there for the axles. I thought of this after I ordered them and called him, I believe Albert Waynburg (SP) did the same after talking with him a few days ago. Edited 2 time(s). Last edit at 04/02/2009 12:28AM by 74ls1tr6. I have put in an order for a run of 10 more sets of disk brake brackets yesterday! This coming Monday, the machine shop will let me know of a completion date. Same price of:... Look here for price at the bottom of page...[forum.britishv8.org] shipped in the US and more postage out of US. The machine shop let me know the brackets are being plasma burned now! There are 7 sets out of the 10 spoken for already, and 1 inquiry as of today! Also had an inquiry to have these brackets made in aluminum 1/2" thick (for unsprung weight). I'm getting a quote for 1/4" thick steel brackets too. The only difference using 1/4" steel brackets, would be 1/4' shorter trailing arm studs, and 1/4" shorter caliper mounting bolts. A caliper bracket made in 1/4" steel is plenty strong; they use 1/4" for off road racing. Edited 1 time(s). Last edit at 08/31/2009 03:20PM by 74ls1tr6. I will picking up the run of disk brake brackets today! Will be painting them within the next couple of days + drying time. There is some left up for grabs from this run still. Got some pricing on 1/4" steel brackets and 1/2" aluminum brackets. Finding out if the machine shop is setup for the run, it's easier to get the 1/4" steel and 1/2" aluminum ones made and not have a full 20 pieces made. Will post pricing in classified section. I have all the files for the rear brake bracket for every format except PDF. Does anyone have a pdf format? I just sent to your email the CNC CAD files, post updates on your progress to BV8!